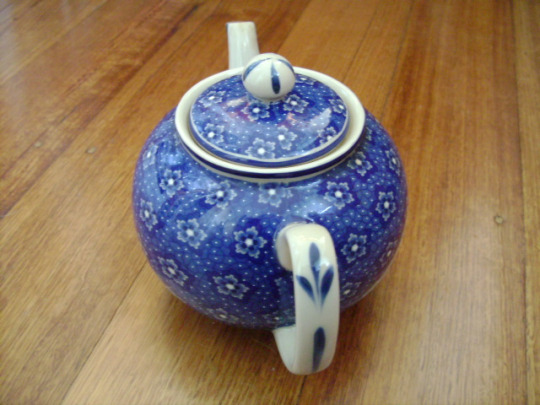 Really, this is just an excuse to post a photo of my beloved blue teapot, bought in the quirky country town of Castlemaine while on a rare weekend away with my husband a few years ago. When we first met, we bonded over drinking tea – we agreed the best cuppa is made in a teapot, with loose-leaf tea. For at least a couple of years, we both made the tea carefully using a little strainer, thinking that’s what the other person preferred. Finally we found out we were just being polite, and the strainer was ditched. Nothing wrong with learning how not to drink the dregs at the bottom of the cup! It took my husband about five years of nagging before I stopped having milk in my tea. He says the flavour is much better. I now quietly agree with him, although my real reason for giving up milk was that my stomach no longer tolerates it. We did a lot of camping when I was a kid, and I have strong memories of tea brewed in our old blackened billy, hanging on a stick over the camp-fire with a handful of tea-leaves tossed into the boiling water, like the drovers used to do. Apparently they used to add a gumleaf or two, but I don’t think we ever did – eucalyptus is a strong flavour! It was enough to drink hot tea on a cold night around the fire, with damper cooked in the embers. Tea aficionados are about as fussy as coffee drinkers, and we have a lot of both in Melbourne. There’s a ritual in how you make the cuppa, and everyone has different ideas. Do you rinse the teapot before use, and ‘warm’ it for the tea? Do you pour the water on while it’s boiling, or off the boil? Milk or none. Sugar? Milk first, or last? In a mug or china tea-cup, with or without saucer? Lemon? I don’t know anyone who takes lemon, to be honest. Tea bags? Yuk, never if we can help it! They rarely make the grade for flavour unless they’re high-quality. Perhaps it’s true about the rumours of bags being filled with the dusty scrapings off the tea-factory floor? And they’re not good for the environment, all those millions of little bags, strings, and the silly staples attaching the brand labels. But it’s getting harder to find loose-leaf tea on the supermarket shelves these days. I don’t understand it. Really, all it takes is tossing out the tea-leaves, into the garden or the compost bin. Hubby and I judge the quality of cafes by how they serve their tea. The worst is when you get the lovely china cup and saucer, plus teapot, milk jug and sugar, all on a tray. But when you open the teapot to check, there’s the teabag, skulking. Such a disappointment. There’s many variations on tea flavours too, of course. We’ve come to enjoy a mix of ‘normal’ black tea with Earl Grey tea, for a stronger flavour with a twist. 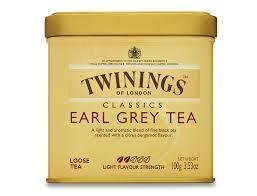 I’m not sure what it is about Earl Grey – it’s not for everyone, but a lot of writers seem to swear by it. I crave it when sick for some reason. Maybe there are health benefits to be found in bergamot extract, the citrus ingredient that gives the tea its perfume. Whatever it is, a tea addiction is certainly one of the better addictions to have, and while it’s lovely to explore new things while on holiday, it’s always a comfort to return home to your own teapot, favourite cup, and brand of tea. Now, will you be mother? This entry was posted in Family and tagged Earl Grey, family, Tea, tea drinking, tea-pots, traditions. Bookmark the permalink. 6 Responses to Tea, darling? I have wonderful memories of having tea with my grandmother and it was always, always, loose tea in the pot. Then she would read my fortune. She wasn’t a fortune teller, but an entertaining grandmother. I’ve tried so many teas but have never been able to find one that tasted like hers. I actually don’t drink tea or coffee. To the everlasting amusement of my Australian cousins, I live up to the stereotype of an American and have a Coke in the morning (and many after that!). Funny enough, though, when I got married, I had a tea party for my bridal shower, as it went well with my soon-to-be royal name. Oh, I think it’s the same connotation here – it was a great shower. I had a wonderful time! Now soda or pop just doesn’t bring on all of the comforting associations we all have with tea or coffee. I think yours and Sarah’s are quite lovely and I thank you for sharing them with me.